How many team members to a team? We encourage you to recruit between 6 and 8 team members for your Amici’s Canoe Heads for Kids Team. Any more than 8 is hard to keep track of while on the water, and for safety reasons paddlers need to be able to keep track of their teammates. If you are a Canoe Heads paddler/portager, you’ll need to supply your own equipment including a canoe, paddle, and PFD or lifejacket. How do I register for Amici’s Canoe Heads for Kids? After you’ve selected the right option above for you, follow the prompts and you’ll soon be a registered participant of the event. If you are a returning participant, you can sign in with your previous year’s username and password to make the registration process easier! Remember that in order to register as a team member of an existing team, your team captain must have already registered your team. If you can’t find your captain or team name in the registration process, please contact your captain and kindly remind them to register your team, or you can contact Amici at 416-588-8026 and we’ll give you a hand! Can I participate as a non-Paddler/Portager? Yes! You can register for Amici’s Canoe Heads for Kids as a member of Amici’s Canoe Crew. Members of the Canoe Crew can join an existing team, start their own team, or fundraise as an individual apart from any team. For more information please visit our AMICI’S CANOE CREW page or contact Amici at info@amicicharity.org or 416-588-8026. There is a registration fee that participants will pay upon registration. This fee provides you with an event t-shirt and lunch on event day. If you sign up on or before April 7, the fee is $45. If you register after April 7, the fee is $55. How will I get my paddle and PFD from Harbourfront to the lunch location at Sir Casimir Gzowski Park? Though you do need to bring your own PFD and paddle, you won’t be using those until your team starts the paddling leg of the route following lunchtime. The launch of the paddling portion of the event will be at Sir Casimir Gzowski Park, 2001 Lake Shore Blvd W., Toronto. If you have a friend or family member who would bring your equipment to Sir Casimir Gzowski Park, that would be great! They can drop the equipment off with our volunteers at Sir Casimir Gzowski Park starting at 2pm. They will find the volunteers at the Gazebo, east of the playground. Otherwise, our volunteers will look after transporting this gear for you. Will food be provided for event participants? Yes, complimentary snacks are provided for all participants at the start of the event as well as at Sir Casimir Gzowski Park following the portage. A small variety of drinks will also be available, however to lessen the environment impact of this event, you are encouraged to bring a reusable waterbottle. We recommend you bring some other snacks with you to munch on throughout the day. No. Amici’s Canoe Heads for Kids is a fun event for a great cause. There is not a competitive element to the event, and no prize for the fastest team. We want each team and participant to be able to enjoy the event safely at their own pace. Please arrive at Harbourfront Canoe & Kayak Centre at 283 Queens Quay W. at 12pm. There will be time to meet your teammates and prepare for the start of the event before the portage commences at 1pm. Stay tuned for details about this year’s event schedule and start times! There is public parking available on the North/West side of Queens Quay and Rees Street (318 Queens Quay W.), and beneath the Radisson Hotel (249 Queens Quay W.) next to Harbourfront Canoe & Kayak Centre. Where do the funds that I raise go? 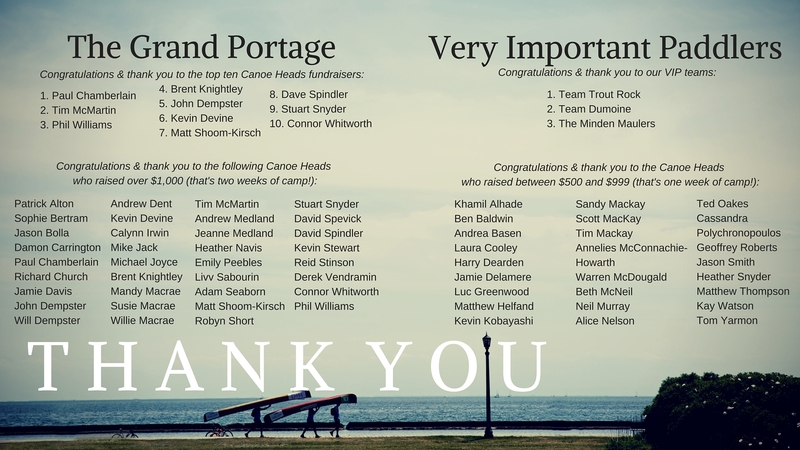 Through fundraising for and donating to Amici’s Canoe Heads for Kids, you are supporting Amici Camping Charity and funding the summer camp experience for boys and girls from low income families who couldn’t afford it otherwise. The campers you help will have the opportunity to return to camp for as long as he/she is old enough to attend. Once through their individual camp programs, many past Amici campers have been hired on as camp staff at their respective camps! As for the summer 2016, Amici has already seen a 20% increase in Amici campers in leadership programs! There’s no doubt that the positive impact of a single two-week session at camp can be significant. However, at Amici we believe that 21st century skills such as leadership, independence and self-confidence are most effectively developed over time. Amici fosters a lasting relationship between a sponsored child and his/her camp, encouraging each child to grow a little bit more at camp each summer. Through our multi-year support, Amici aims to set each child on a stable path to a brighter future. The funds that you raise will give children the opportunity to escape the city life for a few weeks during the summer, and discover their full potential in entirely unique and supportive environment.